* This skin is part of Anion mini suite. 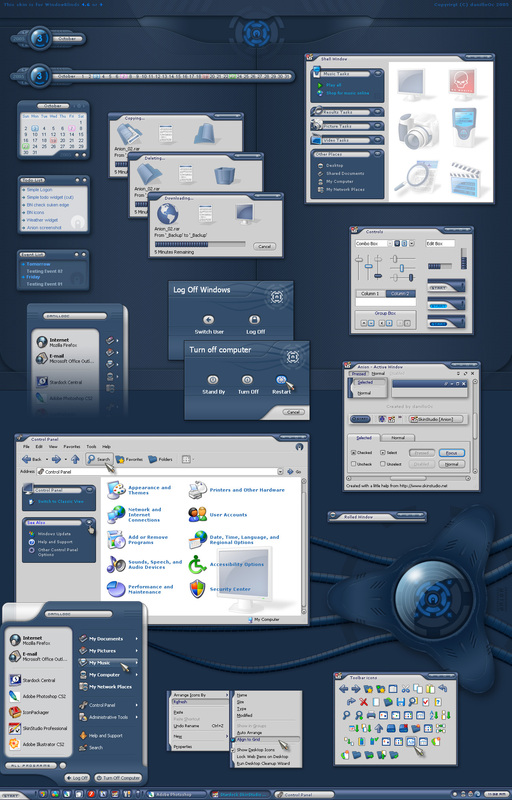 * Important: this skin is for WindowBlinds 4.6 or newer version! (Control + click) on maximize/restore button make the window transparent. You hope we like it? Are you kidding? As always top notch! Thank you for being a skinner. Just keeps getting better and better Danillo. A keeper for sure. Thank you very much for sharing. Very nicely done! Great stuff! I picked it up at DA. Beautiful!! This is ... well, if someone would ask me to explain the meaning of the word "perfect", I would reply: Look at this skin. Everywhere I look, every single pixel on the screen is in the right color, the right shape, the right ... uh, I'm running out of words. Ohhhh... very beautiful Onion skin, Dani! Every skin I use seems to be one of your's. That should tell you something. Your work is amazing. Great Skin!!! My clock isn't placed right. Any hint? Your best effort to date ... no question. I like it a lot. Once again, an excellent piece of work. Thanks for sharing it. I've been wanting a skin like this one! Thanks! Holy God! Game over... Done... Finish!